History: Trip Monroe wanted to be like his grandfather, one of Vaudeville's biggest stars and stand-up comics. Sadly the audiences didn't find him funny, his fiance dumped him and he ended up broke. 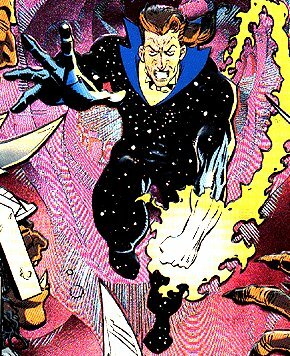 However he then discovered and unwittingly inherited the rest of his grandfather's legacy - he found that he was a magician charged with defending the Earth from other-dimensional threats, such as the Corpii. Armed with magic he doesn't really understand, artifacts left to him by his grandfather, and comedy routines that weren't funny in this dimension, never mind other ones, he is all that stands between Earth and total destruction. And he's not happy about it. Comments: Created by Clive Barker. Written by Frank Lovece, who kindly supplied corrections and additional information to the above page, and who describes Trip as "a failed standup comic who, through circumstances, finds himself Earth's champion against interdimensional religious warriors who are ruthless, bloodthirsty, and extremely polite."